The cars are parked outside because we’ve taken over the garage. Tools are everywhere and the floor is covered with sawdust. We are amateur woodworkers who are always planning ahead for our next project. It will be even better than the three we’re working on now. We can’t stop talking about it, so we formed a club. To satisfy this passion we help our members get the most of out woodworking. We do this by offering our members three primary components to fostering their woodworking obsession. Learning comes from a variety of sources. At each monthly meeting we set aside the second hour for a presentation on some aspect of woodworking. An annual seminar is scheduled in early spring featuring a prominent guest speaker from the woodworking community. This web-site has resources such as blog posts covering a variety of woodworking topics. We’re here to make sawdust. Several time a year the Guild organizes “sawdust sessions” at member’s shops to build projects. The annual spring seminar is hands-on, where participants will work on their own project. Many of our Guild members are happy to mentor others who have an interest in their specialty. We’re proud of what we build and hope others will appreciate the design and execution. During the first half of each monthly meeting we set aside time for member “show and tell”. Each November is a juried “Super Show and Tell” with several categories. This web-site has a Gallery of members’ works for you to browse. We meet on the second Thursday of each month, January through October, at the Woodcraft of Orlando, FL The meetings are from 7 to 9 pm. Guests are always welcome. Several other events are announced throughout the year; check our events page for details. Each year the Guild hosts a weekend seminar featuring a prominent woodworking authority. This event is generally held in February. We are pleased to announce that Garrett Hack has agreed to speak to the Guild on February 22-26, 2019. 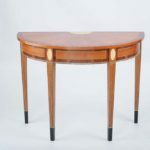 Garrett is a professional furniture builder in Vermont and a contributing editor to Fine Woodworking magazine. He has over 50 articles in this one publication alone. He is most known for his expertise on hand planes and hand tools; publishing books on these subjects. Some of you may recall that he was here 10 years ago to address the Guild. * The fee for the weekend seminar is subsidize by your annual membership fee. **A material and tool list for the ‘Hands-On’ session will be available shortly. New to Garrett Hack publications and classes? Watch this interview by Highland Woodworker. 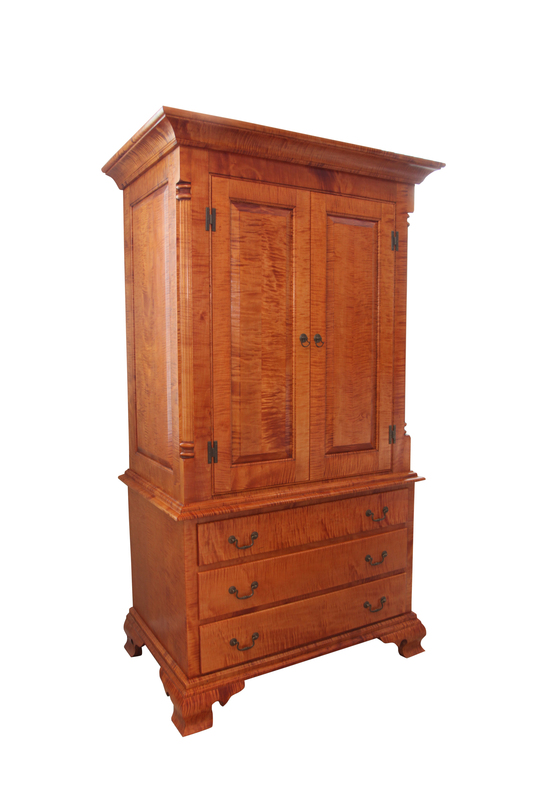 Standing at 89″ high, this impressive 18th century inspired armoire is built of curly maple. Raised panels adorn the sides and doors. This cabinet sits on top of ogee bracket feet. 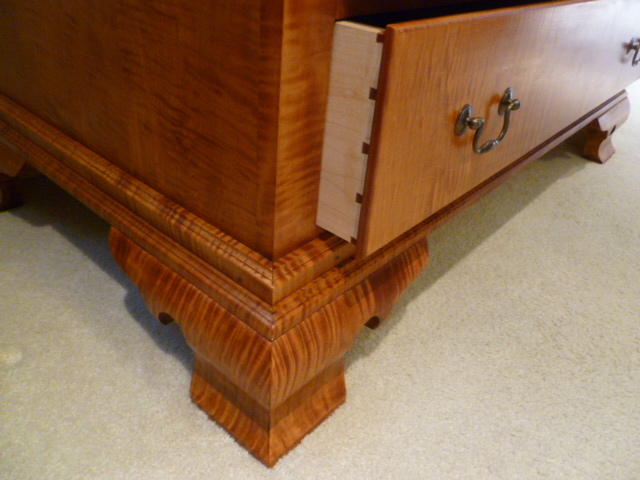 The dovetail drawers are hand cut. A second view of the details. 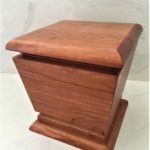 Central Florida Woodworking Guild has teamed up with the South Florida Woodworking Guild to build urns for the Missing in America Project. 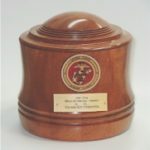 The cremated remains of hundreds of military veterans are unclaimed each year. The mission of the project is to locate and inter our forgotten heroes.